Owl Things First! 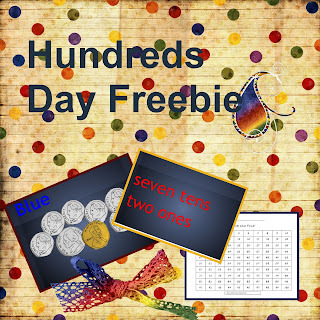 : Hundred's Day Freebie! Hundred's Day has come and gone again! For weeks I was trying to think of things that would make this 100's Day different, special and unique. I wanted to really wow my students. I was trying to plan THE BEST DAY EVER!! I'm so glad I realized that it is all new to my owlets. I feel like we did "the same old thing," but realized after hearing many, "This is the best day ever! "s that the same old thing to me is exciting for my class. The smiles, the hugs and the excitement will never be the same old thing to me. They will forever be precious and meaningful! One of the things I love about six year olds is their enthusiasm... They love everything. I did do one thing different this year. It got a little bit long, but they hung in there and finished! They had to follow the directions in a PowerPoint presentation to find a picture hidden in a hundred's chart. We got up and moved around for a while half way through. I think I'll try doing some more of these for different occasions. Feel free to use this if you'd like! You'll need THIS and THIS! Our collections of 100 spread across the floor.